Honolulu Star-Bulletin reporter Gary Kubota will be traveling with the Hokule'a during its voyage in the Marshall Islands. MAJURO, Marshall Islands » As the Hawaiian sailing canoes Hokule'a and Alingano Maisu approach Micronesia, plans are moving forward for welcoming celebrations. 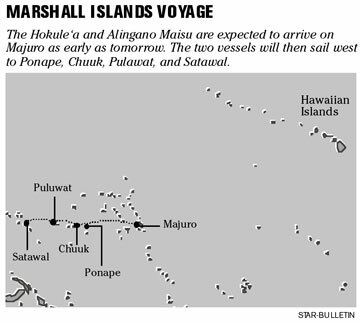 Kesai Note, the president of the Republic of the Marshall Islands, is expected to be among the dignitaries greeting the vessels that have sailed 2,200 miles from Hawaii using traditional methods of celestial and ocean navigation. The voyage through Micronesia will honor Mau Piailug of Satawal, who taught Pacific wayfinding to native Hawaiians, and to deliver the Alingano Maisu as a gift. "This voyage is a testament to all that Mau has taught our people over the past thirty years," said Pomai Bertelmann, whose family helped to build the Maisu. "It is about the relationships that are being reinforced and made between Hawaii and Micronesia." Hawaiian navigators on the two vessels are headed toward Majuro, an atoll with a total land mass of 3.75 square miles and an average elevation of about 7 feet. The vessels were about 165 miles from Majuro yesterday morning and are expected to arrive at the lagoon tomorrow. Majuro Atoll resembles a giant Hawaiian fishpond, with a nearly unbroken ring of green foliage and white shores. The two vessels encountered some of their worst weather a few days ago, when a squall brought winds in excess of 41 miles an hour. To prevent damage to the masts and other equipment, the crews were forced to lower their sails and ride out the storm while steering toward Majuro. Storm clouds were so thick that lead navigator Chadd Paishon of the Maisu was unable to see the North Star for two nights. Paishon adjusted his course to Majuro after the clouds cleared yesterday morning, Hokule'a spokesperson Kathryn Thompson said. Majuro, the capital of the Marshall Islands, holds about half of the republic's estimated 60,400 residents. The Big Island voyaging canoe Makali'i visited Majuro and other areas of Micronesia in 1999, honoring the contributions of a sister culture that has cultivated traditional Pacific navigators such as Piailug, who helped to spark a renaissance in voyaging canoes. The late Clay Bertelmann, who appreciated Piailug's contribution, promised to build him a vessel. Bertelmann's brother Shorty is serving as captain of the Alingano Maisu on the voyage. Bertelmann's daughter Pomai said the vessel, developed by the Big Island-based nonprofit group Na Kalai Wa'a Moku o Hawaii, took five years to build, and hundreds of people helped, including Oahu canoe builder Kawika Eskaran. "Some people were highly skilled and others were laborers, but everybody gave what they had," said Eskaran. 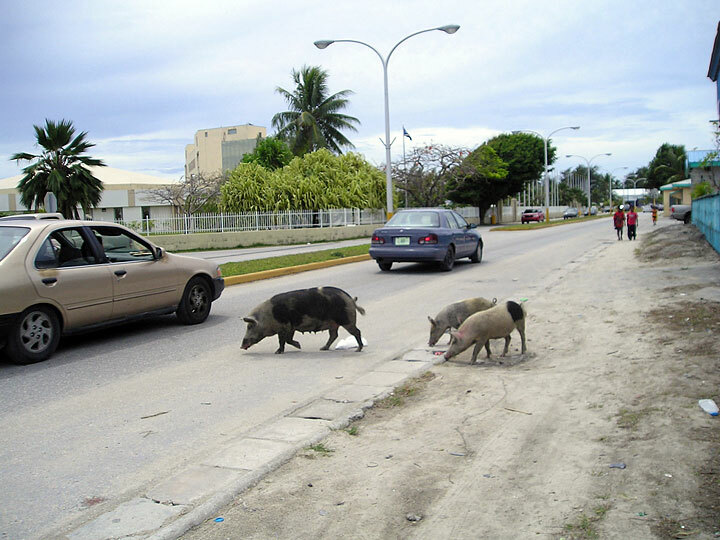 Piailug, now 74 and in waning health, was criticized by some Micronesians for sharing the Satawal wayfinding knowledge with native Hawaiians. But back in 1976, he was worried that interest in traditional wayfinding was waning and felt the only way to keep his knowledge alive was to share it with native Hawaiians, people close to him have said. His dream was that one day the Hawaiians would return to help Satawal islanders continue their sea-voyaging tradition. Onboard the Alingano Maisu and helping on this pilgrimage is one of Piailug's sons, Sesario, who learned wayfinding from his father. Native Hawaiians hope the gift of the vessel will help to soften whatever hard feelings exist between Piailug and his critics. To be based in Satawal and Yap, the Alingano Maisu will help Micronesians with interisland travel and to teach traditional wayfinding to their youth. Satawal, a mile long by a half-mile wide, has no air transportation. The only way to reach it is by an ocean-going vessel. The Hokule'a and Alingano Maisu are expected to spend a couple of days on Majuro to take on provisions and some new crew members. From there, the two vessels are scheduled to sail west to Ponape, Chuuk, Pulawat, then Satawal. The voyage then continues west to Woleai, Ulithi and Yap, then on to the Republic of Palau in mid-March to complete the Micronesian trip. A Japan leg of the journey from March through late May, a 2,675-mile journey, will honor the late King David Kalakaua and his role in opening the doors to Japanese immigration in 1885. The Hokule'a will sail from Palau to Okinawa, then Kumamoto, Nagasaki, Fukuoka, Yamaguchi, Hiroshima, Uwajima and Yokohama, where Kalakaua signed the immigration treaty.